One week ago, Entertainment Weekly reported that Disney was poised to break yet another color barrier in princess land with the unveiling of Sofia, the first Hispanic member of the royal House of Mouse. (Jasmine, the first Arabic princess, won over hearts as early as 1992, but the first black Disney princess, Tiana from The Princess and the Frog, came just three years ago.) 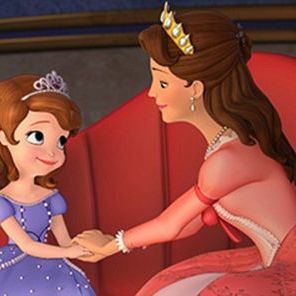 Except Sofia — making her debut in Sofia the First: Once Upon a Princess on the Disney Channel and Disney Junior on November 18 — may not be nearly as trailblazing as Disney at first hoped. There’s her relatively fair complexion and her blue eyes, as critics have pointed out, and the fact that she’s being voiced by Ariel Winter, the (yes, Caucasian) young star from ABC’s Modern Family. “They’ve done such a good job in the past when they’ve introduced Native American, African-American and Asian princesses,” a spokeswoman for the National Council of La Raza tells the Houston Chronicle, “but now they’re sort of scrambling.” The show’s executive producer insisted that “she is Latina,” though a co-executive producer quickly backpedalled by calling her a “mixed-heritage princess,” explaining that her mother — the noticeably darker-skinned Queen Miranda — is from the enchanted kingdom of Galdiz, inspired by real world Spain. So, technically she’s Hispanic, we guess. Is Disney’s ‘Latina Princess’ Not Latina Enough?